Over 140,000 pre-trial detainees are being held in overcrowded Philippine prisons, many on trumped up drug charges; 75 percent of the total prison population still awaits their day in court, let alone conviction. On top of this, assassinations of human rights lawyers, journalists, labour and peasant organisers, indigenous leaders, clergy, teachers, and activists are spiralling out of control. Meanwhile, less known to US audiences, Duterte has dropped bombs on Philippine soil over 368,391 times — and some 450,000 civilians have been displaced by militarisation. After scuttling peace talks with the National Democratic Front of the Philippines (NDFP), Duterte has jailed internationally protected peace consultants. And in January, consultant Randy Malayao was murdered in cold blood by armed hit men. Ever since the Philippines attained formal independence in 1946, the US has maintained a military presence on its former colony, guiding and supporting “counter-insurgency” operations to put down constant rebellions against an oligarchic government. Today, the Philippine armed forces overwhelmingly direct violence not against outside invaders, but at poor and marginalised people within its borders. US military aid is only making internal conflict worse. In FY2018, the Defense Department provided roughly $100 million in military aid, including equipment, weapons, and aerial surveillance systems, to the Philippine military and police, though Operation Pacific Eagle — a so-called “overseas contingency operation” that is exempt from congressional limits on spending. The amount demanded for this programme will increase to $108.2 million for FY2019 — even as the Defense Department has admitted it lost track of transactions for 76 of 77 arms sales conducted under bilateral agreements with the Philippines. In 2018, on top of the above, the US sold the Philippine police and military over $63 million worth of arms. It also donated 2,253 machine guns, over 5 million rounds of ammunition, surveillance equipment, and other weapons. Military aid totalled at least $193.5 million last year, not including arms sales, and donated equipment of unreported worth. At least $145.6 million is already pledged for 2019. In January, Trump authorised $1.5 billion annually for the Asian Pacific region, including the Philippines, from 2019 to 2023. Although this authorisation includes a stipulation that counter-narcotics funds will not go to the Philippines (“except for drug demand reduction,” a potential loophole), it’s too little, too late. The set-aside has no restrictions on weapons funding for the Philippine military. And separately, the State Department already plans to deliver $5.3 million this year to the Philippine police for anti-narcotics activities. Worse, rampant corruption together with a total lack of transparency means it’s hard to ensure where military aid could actually end up. Duterte has embarked on an ambitious programme to “modernise” the Philippine military, massively increasing funding and pouring more money towards this than spent in the last 15 years. (Meanwhile, he’s doubled the salaries of military and police.) He could not do so without US aid and arms. What’s more, this year’s Operation Pacific Eagle budget sets aside an extra $3.5 million for US military efforts to collect and analyse “local media in native languages” — underscoring that the US is striving for an upper hand in directing Philippine military operations. And in winning an information war over public opinion. In the case of the 2015 Mamasapano massacre, supposedly under the jurisdiction of Philippine police and military only, hearings later uncovered US guidance and surveillance support, despite US denials. Meanwhile, US troops who themselves commit human rights abuses, murder, or sexual assault, are insulated from being held accountable by the US-Philippines Visiting Forces Agreement. The bottom line is, the US government is complicit in — and actively supporting — the deepening human rights crisis in the Philippines. Labour leaders are being slaughtered using tactics similar to those in the drug war. Edilberto Miralles, president of R&E Taxi Transport union, was shot in broad daylight in front of the National Labour Relations Commission in 2016. Linus Cubol, chair of Kilusang Mayo Uno in Caraga, was murdered in November by vigilantes riding in tandem. Police brutally beat peacefully picketing NutriAsia workers on strike and their supporters, wounding scores; then they charged the picketers with assault, planted weapons, and attempted to suppress journalists’ coverage of the dispersal. Under Duterte, over 134 human rights defenders have been killed. In just one case, in 2017, Elisa Badayos and Eleuterio Moises were murdered while serving on a fact-finding team investigating human rights violations due to militarisation in Negros Oriental. Since 2017, Duterte has imposed martial law on Mindanao. Increasing militarisation is resulting in rampant abuses against indigenous and Moro people. Aerial “surveillance” missions already make up the bulk of US aid to the Philippine military. Most likely in direct relation, bombings in Mindanao have escalated — particularly over indigenous lands, causing mass evacuations. Simultaneously, reminiscent of US-sponsored tactics in Latin America resulting in indigenous genocide, the Philippine military, together with paramilitary groups it arms and guides, are terrorising indigenous communities. The military has recruited and even forced indigenous people to become paramilitaries as a means of divide-and-conquer. Indigenous groups’ resistance is at the forefront of the struggle against climate change, both in the Philippines and globally. Now, their lands, such as those in Mindanao’s Pantaron Range, are some of the few remaining to be opened up to extractive logging and mining by multinational corporations. The militarisation of indigenous lands, purportedly in the name of counterinsurgency, seeks to quell this organised community opposition to corporate land-grabbing and environmental degradation. Education is a centre of community resistance — and now repression as well. The military and paramilitaries are targeting indigenous community schools — turning their grounds into military encampments, shooting teachers and students, bombing the schools — to force their closure. Indigenous children and their teachers are the victims of this campaign. US military aid is intensifying the conflict in Mindanao, exacerbating its impact on civilians. US investment in aerial surveillance will escalate an air war that has a brutal and indiscriminate effect on people as well as the environment. The integration of “intelligence” activity in counter-terrorism is dangerous. It will likely worsen repression against anyone organising for indigenous, labour, and human rights — feeding a growing bloodbath as paramilitaries are employed to undermine these local struggles, while providing cover for government troops to escape accountability. Today’s violence is inseparable from the US’s imperial shadow. The drug war is a purge of humans deemed worthless in a society where social safety nets were never allowed to be developed, where the failure of neoliberal economic reforms now plays into the hands of despotism, and where US-backed elites regularly employ state-paid goons to undermine democracy. Placed in historical context, Mindanao, and those lands of indigenous communities under attack, were some of the last outposts resisting Spanish and US rule. The islands — dubbed by Trump “a prime piece of real estate from a military standpoint” — have long served as a stepping stone towards US aspirations of dominance in the Asia-Pacific. US military aid continues a long process of “pacification” — and colonial conquest, now unfolding in neocolonial forms. 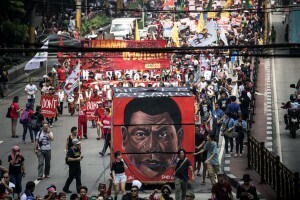 They demand also peace with justice — a peace process that adopts structural reforms like those outlined in CASER, a programme the NDFP sought to reach agreement on implementing via peace talks, that includes land reform, rescinding neoliberal economic policies, and respecting indigenous land and self-determination. In 2016, Sandugo, a historic alliance of indigenous and Moro groups from across the Philippines, formed, uniting for self-determination and a just peace. 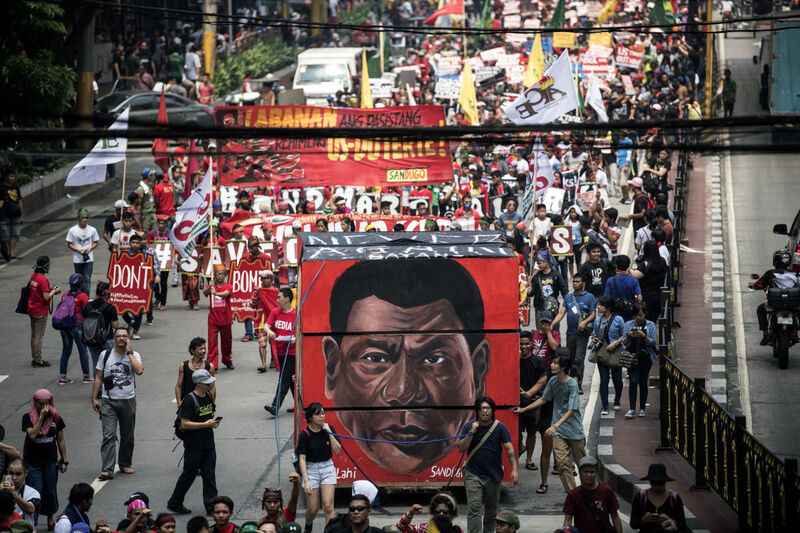 Three thousand delegates met in Manila, and protesters converged on the US embassy, under a banner calling for an end to US intervention and militarisation. At the gates of the US embassy, the Philippine police responded by beating people indiscriminately, and a police van ran over the crowd, injuring dozens. In terms of the drug war, one of the first groups to come out in vocal opposition was Kadamay, a mass-based organisation of urban poor people. Instead of killings, Kadamay has called for addressing poverty and the root causes of the drug problem — in short, for drug addiction to be treated as a health, not criminal, issue. More recently, an organisation of family members of those killed in the drug war has formed, Rise Up For Life and Rights. The continuing drug war killings and rampant human rights abuses only underscore that there is no way to ensure US military aid to the Duterte regime does not enable human rights violations. For its part, US military spending is not only overblown, but also often untraceable, secretive, and unaccountable. From Central America to Palestine to the Philippines, US military aid has a sordid legacy of fuelling atrocities.